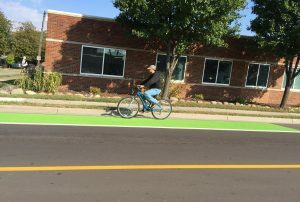 Chances are, you’ve noticed new street markings popping up on roads in and around your community: arrows with a bicyclist below, striped lanes with a bicyclist in the middle, or even plastic poles next to bike lanes. 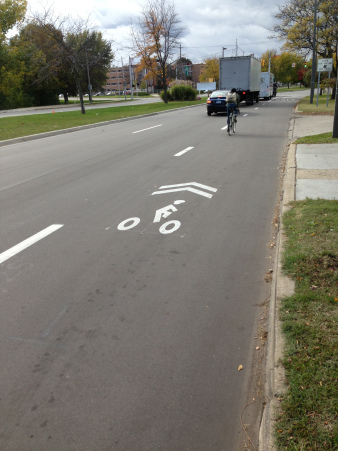 If you’re like most people, these markings raise more questions than they answer. 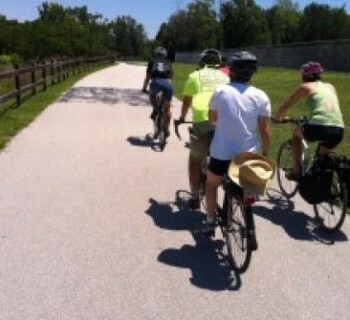 Are they pointing me to where I can ride my bike? 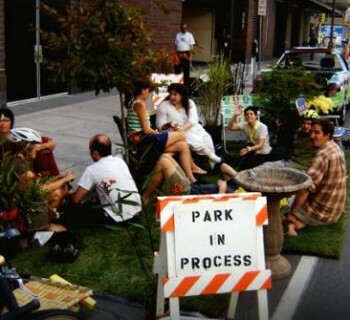 Are they a new type of parking lane? And what’s with the green paint? A combination of the words “share” and “arrow,” sharrows are intended to serve as a visual reminder that space on the road is meant to be shared by bikes and cars. Sharrows don’t provide for dedicated space on the street for people biking (meaning cars can still use a lane with sharrows in it); they indicate a general area on the road in which it should be safe for people to bike. 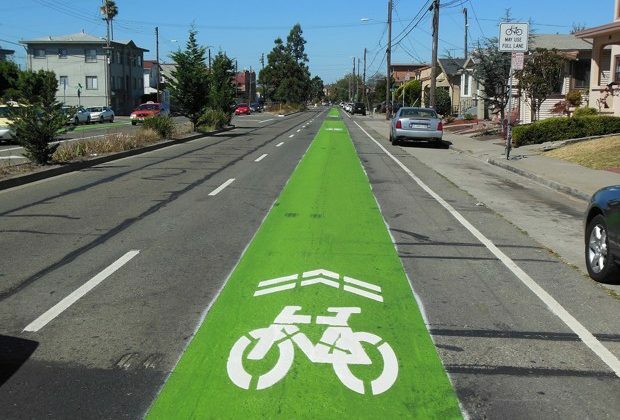 Some cities such as Oakland, CA, have implemented “super sharrows” by placing the sharrow marking in the middle of a five-foot green bike lane to help clarify where bicyclists should ride. 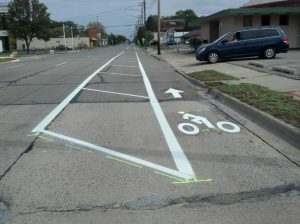 Striped bike lanes aim to provide a clearer sense of where cyclists should be on the road by creating a lane for bikes. 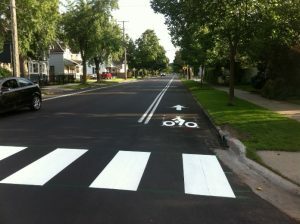 Typically, these lanes are striped with white paint and are often located on far right side of the road. 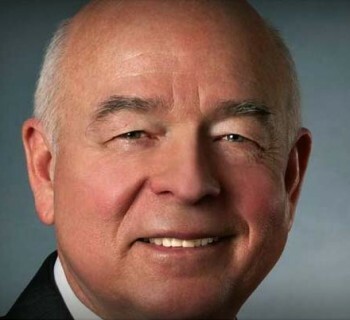 They may be painted a separate color to draw more attention, such as those found in Ferndale, MI. 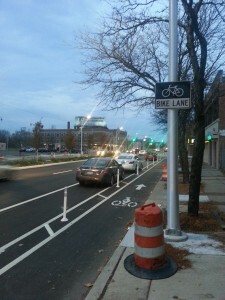 Drivers are not permitted to drive or park in bike lanes of any kind. 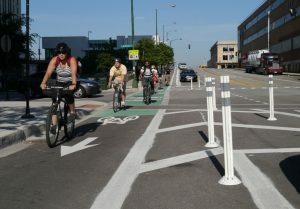 Buffered bike lanes create a dedicated lane for bikes, with the added benefit of putting extra space between cyclists and passing cars, usually with a painted safeguard area of one to two feet. Drivers must stay on the left side of the buffer while driving and can only cross the bike lane when making a turn or entering an adjacent property - after checking to be sure there are no people biking in the lane, of course. 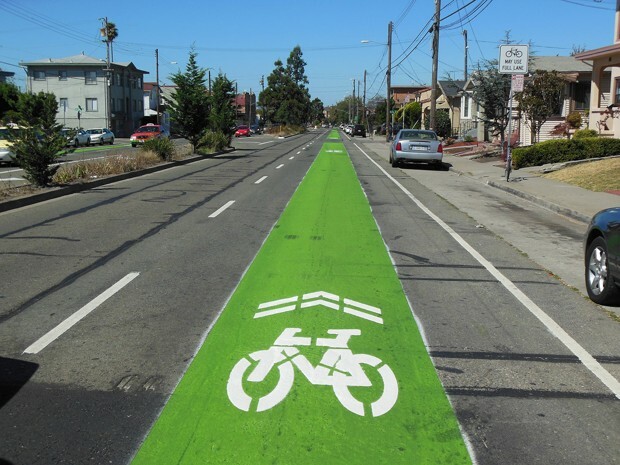 While they cost more money than other bike lanes and street markings, protected bike lanes clearly delineate space on the road for bikes and prevent cars from infringing on that space. Installing physical barriers such as plastic bollards on street parking or even planters offer the greatest degree of protection for people riding bikes in on street bike lanes. The first stretch of protected bike lane in Michigan was installed along East Jefferson Avenue in Detroit in late 2015. It should be noted that, while street markings and bike lanes are intended to make the road safer for everyone, people who ride bikes have the same rights on the road as people who drive cars. 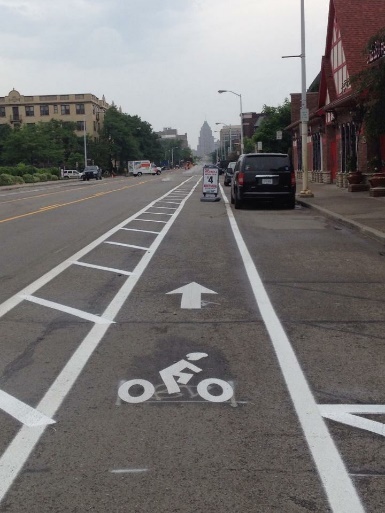 According to the Michigan Vehicle Code, "Each person riding a bicycle...upon a roadway has all of the rights and is subject to all of the duties applicable to the driver of a vehicle…” So whether or not there is a sharrow, share the road with your fellow cyclists and drivers! Note: Different states may have different laws.